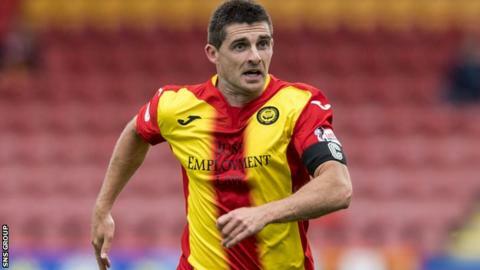 Partick Thistle are in no mood for Christmas parties as they look to move off the foot of the Premiership, says striker Kris Doolan. A run of three defeats and a draw has seen the Jags slip four points adrift of Ross County and Dundee. And manager Alan Archibald was alarmed by Saturday's 5-1 defeat by Kilmarnock. "When that third goal went in, there was an acceptance of the result and it became a bit easier for Killie to score again," said Doolan. "It is difficult to make sure the heads don't go down because we are quite a young team. "Some people are affected by the negativity and looking at the league table, which isn't great. "But you still have to have characters in the changing room, guys who can put a smile on your face, because you play better when you're enjoying yourself and relaxed. "That enjoyment has to go hand in hand with the hard work, though, so right now we have got the bit between our teeth and we're knuckling down. "There won't be nights out. That just won't happen. It's all about business for us. At this stage of the season, the way things are (Christmas parties) just won't be an option. "Our position dictates it's all about hard work and that's what's going to happen from here on in." The Jags host Motherwell on Wednesday, followed by a trip to Dundee on Saturday. Their current position is familiar since Thistle were bottom of the table last Christmas only to finish sixth - their highest league placing in 36 years. "Something has to happen soon," added Doolan. "It's fine saying we were here last season and still made the top six. "But we're now getting to the stage where something has to change. We can't just keep talking about last season week in, week out. "We need points on the board as we're now adrift. "The good thing from our point of view is that one win could put us back in amongst it, but it has to happen soon. "Right now, survival has to be our sole aim. We can only think about getting ourselves back into the mix - then we can take it from there."